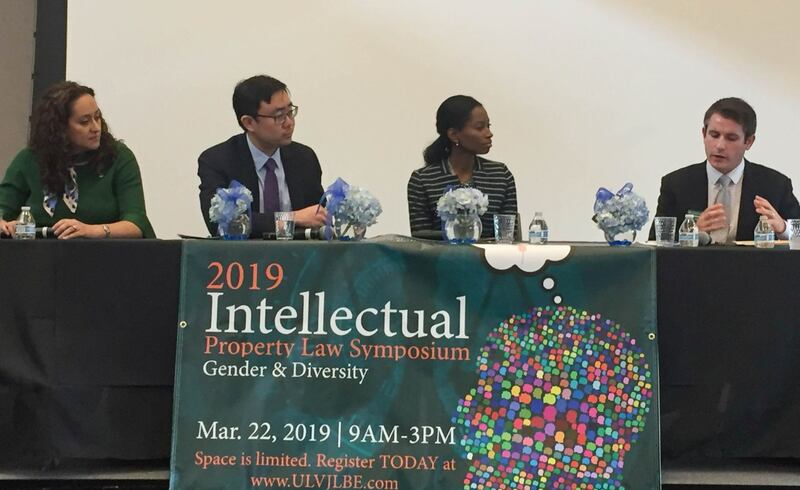 In honor of the Journal of Law, Business & Ethics’ 25th Anniversary, the University of La Verne’s College of Law hosted an Intellectual Property Law Symposium centered on the topics of gender and diversity at the Sara and Michael Abraham Campus Center. More than 40 students, faculty, and staff participated in the interactive panel discussions led by Timothy McFarlin, assistant professor of law. Industry experts included Christina “Tina” Loza, Tearra J. Vaugh, Paul Y. Liu, Kevin J. Greene, Kyle Webb, and Joshua Kanassatega. The renowned group of attorneys, entrepreneurs, and business professionals discussed how the legal field is continually evolving to be more diverse and inclusive. “It’s imperative for more females to be represented in the field, and more importantly women of color,” said Tina Loza, who serves as managing partner of Loza & Loza, LLP. Keynote speaker, Hon. Tracy Nadzieja, shared her incredible story in becoming the first known transgender judge in Arizona. She was appointed in April 2018 as the Superior Court Commissioner for the Maricopa County Superior Court and the Criminal Department and Initial Appearance Court. Nadzieja spent decades trying to hide her true self from family and friends until she made the decision to live life for her. Over her 25-year career in civil litigation, Nadzieja aspired to use her education and legal experience to help people beyond civil practice. The mission of the Journal of Law, Business & Ethics is to promote scholarship through a student-led scholarly journal devoted to the intersecting paths of law, business, and ethics, with a focus on serving the legal profession and its students. For more information on the College of Law, visit law.laverne.edu.